Cacti of the Pelecyphora valdeziana (6,5) species are approx. 2008 years old and are planted in 6,5 cmpots. 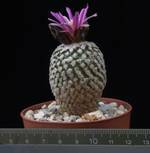 Pelecyphora valdeziana (6,5) is available for only 10.00 €! Rariteta na lastnih koreninah, raste zelo počasi.